Save Over $649 On Select TreadClimbers from Bowflex Direct! See individual items for full details - Limited Time Offer! Bowflex TreadClimbers are the answer for those who wish to step up from a routine treadmill workout to a more effective and more efficient low-impact workout. When Bowflex set out to shake up the treadmill category little did workout enthusiasts realize that the result wouldn’t just be a Bowflex treadmill or stair climber but something much better and truly groundbreaking. The result was the Bowflex TreadClimber. The TreadClimber’s revolutionary design combining the features of a traditional treadmill with a continuous climbing upward motion allows you to get the most from your workout time. It can literally give you greater benefits while cutting your workout time in half. Compare the models and see which one is right for you! Bowflex TC20 TreadClimber is the top of the line model in Bowflex’s revolutionary TreadClimber family. It offers cutting edge features and superior ease of use that will ensure your fitness success. The TC20 TreadClimber will help you burn calories, fat, and get your heart pumping, in half the time and effort of a regular treadmill! The innovative technology and cutting-edge features of this machine are unparalleled, and there is truly no competing product like it on the market today. The TC 20’s revolutionary design combines the agility of a cardio workout on a treadmill with the added challenge of a continuous climbing upward motion. It provides personalized programs and adjustable speeds to optimize your time spent on the machine. Bowflex TC10 TreadClimber is a full-featured fitness solution that offers a perfect balance between features and affordability. Its unique design will enable you to take your workout routine to the next level. The TC10 will allow you to get you the fitness results you’re looking for much more quickly than a standard treadmill. Extensive monitoring capabilities keep you informed every step of the way and maximize your workout time while the interactive Goal-Oriented Technology console helps you establish and meet fitness goals. The TC10’s ultra-efficient workout will help you get in shape much more quickly than traditional treadmills. You’ll be amazed at how quickly those unwanted pounds disappear with the Bowflex TC10 TreadClimber. Bowflex TC5 TreadClimber is an economically priced green-friendly fitness solution that offers the cutting-edge technology and innovative features of the TreadClimber family for an exceptionally affordable price and in an environmentally friendly design that does requires no electricity whatsoever. 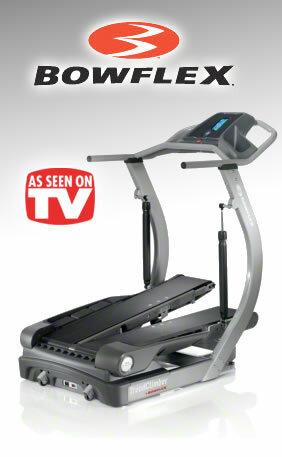 The TC5 features the same TreadClimber technology as the TC10 at great savings. It offers all of the essential features you need to achieve your fitness goals. The TreadClimber’s innovative design allows you to halve your exercise time while still receiving a vigorous workout. The Bowflex TC5 will allow you to get into shape fast while minimizing your carbon footprint! Bowflex TreadClimbers are superior products, and Bowflex stands behind each and every one. Your satisfaction is guaranteed! Just purchase your machine (direct from Bowflex) and workout for up to six weeks. If you're not 100% satisfied with the results, simply contact their customer service department for a Return Authorization, return the machine (including any accessories) in its original condition and packaging to receive a full refund, less shipping & handling. Item must be received no later than 2 weeks after your return authorization is given. Bowflex TC20 TreadClimber is Bowflex's top-of-the-line model in its TreadClimber family. The TC20 offers numerous advanced features including the revolutionary new "G.O. Coach" technology which helps you set, track, and attain your fitness goals. Other notable features include longer foot treadles for greater comfort while working out and an interactive console which provides all the details you could want about your workout. The TC20 TreadClimber even provides storage and tracking of fitness goals and achievements up to two users! Bowflex TC10 TreadClimber provides advanced electronic functions which will ensure that you'll get into shape and lose weight easily and efficiently. These cutting-edge functions enable you to monitor every important part of your workout leading to maximum results. The TC10 also allows you to keep up with all of your essential workout stats with 4 easy-to-see LCD display screens. Bowflex TC5 TreadClimber is an affordable solution for those who desire the benefits of a TreadClimber but require a unit which better fits their budget. It utilizes the same TreadClimber technology as the TC10 in a unique energy-saving design that requires no electricity. The TC5 offers the essentials you need to get into shape and drop those extra pounds.